The device is one 3 Port HDMI Audio Extractor with support of ARC,3D and 4KX2K,which can switch easily three HD Sources or one MHL smart sources to one HD Display. Also any of the input sources support the audio extract by the SPDIF and LR audio output channel. The Switcher supports ARC function that can do TV audio return back to the AV receiver. 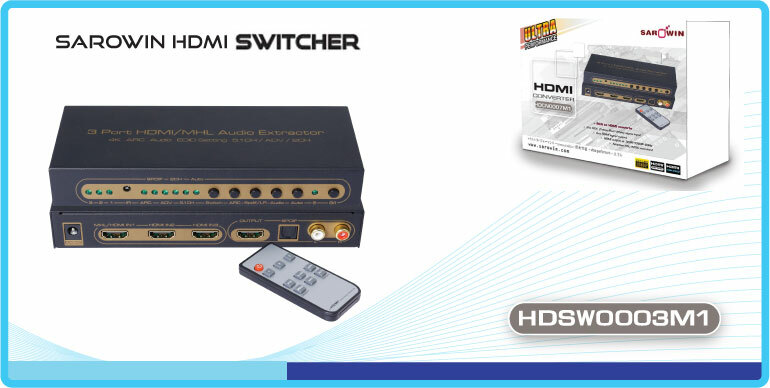 • One MHL/HDMI double input and two HDMI input switch freely to one HDMI output. • Any input HD Source can do audio extract by the SPDIF ort LR audio output port. 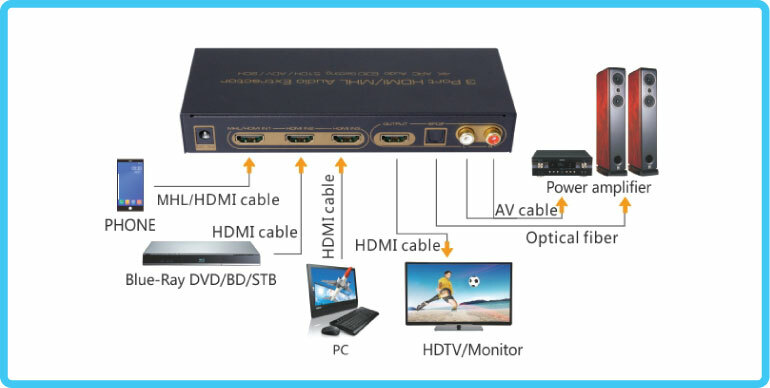 • Support ARC Function: Without adding one extra HDMI Cable, it can reverse the audio to the AV amplifier by HDMI Cable connection with HD TV while the HD TV receives the audio and video content. • LED indication: when source or sink is working, LED related will go bright. • IR Remote can do switch to the Input sources, and also you can press the switch button at device to do switch of the Input Sources. • Led Status Light allows the user to know the working status easily. 1. To use the HDMI cable to connect the input port of 3Port HDMI Audio Extractor with the HDMI sources or to use one MHL-HDMI cable to connect the MHL smart device to connect with the HDMI double mode input port. 2. To use one HDMI cable to connect the HDMI output port of the Switcher with the HD Display. 3. To use one optical cable to connect the SPDIF port of the Switcher with the AV receiver. 4. To use RCA audio cable to connect the LR audio port of Switcher with the Analog Audio Input port. 5. To use the IR remote or the switch button to do control and switch to the Input sources and the ARC/SPDIF function. 6. To connect the 5V adaptor with the device. 2．You can press the number 1, 2, 3 button directly to choose the input channel that you want. For example, if you want switch the input two sources to the output; you can press the number 2 button directly. 8．Auto: Auto Detect Button for Input Sources. 9．The plastic film is strongly advised to insert the rear of the remote board when the remote is not used for long time. Pls use the machine as the instruction listed to keep the long use lifetime of the machine. 1. The machine should be placed at the spot far from the Damp, High-Temperature, Dusty, Erosive, and oxidative environment. 2. All parts will be free from the strong shake, hit, fall. 3. Touching the power adaptor with the wet hands is prohibited. 4. Pls hold the power adaptor head and do not pull the power cord when cut off from the socket. 5. Pls turn the power off when the machine is not used for long time. 6. Pls do not open the cover and do not touch the inside parts. 7. Pls use the original factory power adaptor.